This study systematically reviews the peer-reviewed literature on livestock production and food security in urbanizing environments of developing countries to synthesize the existing evidence and identify priorities for future research. Specifically, a systematic literature review was undertaken using PubMed, ISI Web of Science and Scopus databases over the period 1980–2017, resulting in a final number of 72 articles meeting our selection criteria. The results revealed a fragmentation in the literature, which draws from a very small number of studies, and is positioned in widely varied research areas, environments, livestock systems and consumption patterns. With such heterogeneity, drawing generalizations from the literature may be unreachable. Furthermore, the literature is largely qualitative in nature, with very few comprehensive models to capture and integrate empirical evidence. Food security was typically found to be narrowly defined, focusing primarily on interlinks with livestock supply. Considerably less attention has been given to other relevant dimensions of food security, such as accessibility, utilization and stability. Another important finding of relevance to food security is a need to address the “missing middle” in livestock value chains since the literature has customarily concentrated extensively on the two ends of the livestock value chain, i.e., on production and consumption, while widely ignoring other elements and actors along the value chain. A further focus on the interrelationships between livestock production, food security and urbanization in developing countries through a holistic and interdisciplinary approach is recommended. Particularly, future research aiming to understand livestock systems in the context of rapid urbanization should put more emphasis on addressing the full continuum of the livestock value chain and the four dimensions that drive food security in developing countries and how they possibly interrelate. Over the next few decades, urbanization will be a defining trend in many developing regions of the world, where urban growth is occurring most quickly and where the bulk of extreme poverty is concentrated (Seto et al. 2012; SDSN 2013). Together with associated demographic changes, urbanization is expected to add significant challenges to tackling hunger, food insecurity, and malnutrition in these countries (Brears 2017). In these contexts, food systems are expected to face increased demands for animal source foods and fierce competition for resource use (e.g. land and water), all of which will have further profound effects on food security (Herrero et al. 2010; Buhaug and Urdal 2013; Bren d’Amour et al. 2017). Moreover and relatedly, food production and food value chain systems are likely to undergo significant adjustment processes as poverty becomes increasingly urbanized, as the demand for urban food will grow, and as cities exert greater influence on peri-urban and rural livelihoods and environments (Buhaug and Urdal 2013). As a result, the impact of urbanization on crop and livestock production systems and their implications for food security are increasingly recognized at international and national levels as key components of sustainable development (Sonnino 2016; Szabo 2016; UN-FAO 2017; UN Habitat 2005). Livestock production, the largest land use sector worldwide, is an important part of this scene. Under rapid urbanization dynamics, livestock production will inevitably play an instrumental role in achieving sustainable food security in developing countries (Godber and Wall 2014). Livestock source food (LSF) and other animal products account for approximately one-third of global human protein consumption (Popp et al. 2010). The global livestock sector contributes to the livelihoods of around one billion of the poorest people in the world and employs close to one billion persons (Hurst et al. 2005). As noted by Otte and Upton (2005), the acquisition of livestock in developing countries is widely recognized as a pathway out of poverty, a major income generating activity, a financial instrument, and a means of income diversification. Livestock act as a crucial food resource in the case of crop failures (IFAD 2007; Kabubo-Mariara 2009), especially in low-income areas and marginal habitats that are unsuitable for crop production. They also have the ability to recycle nutrients and utilize marginal land and by-products and turn these inedible by-products into nutritious food for humans (Röös et al. 2017). Furthermore, livestock husbandry on grassland systems contributes to the conservation of rangeland ecosystems and the promotion of the use of land-preserving forages (Janzen 2011). Therefore, Herrero and Thornton (2013) noted that many solutions to challenges facing global food production and consumption lie in how livestock sectors are managed. Particularly, achieving the UN Sustainable Development Goals in many developing countries would depend greatly on the ability of these countries to build sustainable crop and livestock production systems that foster food security to meet the needs of massive surges in the human population (Jabareen 2013; Kissinger and Rees 2010). Urban expansion in developing countries has considerable impacts on livestock production systems (LPSs), influenced by both supply-side shifts in natural resource use as well as market-led demand changes (Thornton et al. 2009). On the demand side, urbanization stimulates demand for LSF since it involves improvements in infrastructure, which allow perishable goods to be traded more widely, as well as changes in food consumption patterns and habits (Delgado 2005; Happer and Wellesley 2019). In many developing countries, a shift from a predominantly vegetable-based diet to one that includes a greater amount of LSF has already been seen over the last few decades, and the demand for livestock products is projected to grow substantially in the coming decades (Alexandratos and Bruinsma 2012; IAASTD 2009). For instance, the average per capita meat consumption is projected to rise from approximately 34 kg in 2015 to 49 kg in 2050 (Yawson et al. 2017). On the supply side, livestock systems will increasingly be affected by competition for natural resources (e.g., land and water), competition between food and feed and by the need to operate in a carbon-constrained economy (Thornton 2010). Additionally, the expansion of intensive livestock production closer to urban centres will create serious problems including increases in land and water pollution and effects on the health of both humans and animals (McDermott et al. 2010). Thus, there are increasing uncertainties about how LPSs in developing countries might evolve under urbanization dynamics and their ability to sustainably meet the increased demand for LSF (Herrero et al. 2016). The past two decades have produced a significant body of research on food supply, both crop- and livestock-sourced, and environmental challenges in developing countries. The present study systematically reviews the peer-reviewed literature on livestock production and food security in developing countries, considering potential influencers within this context, to characterize and synthesize the current understanding on these issues and identify priorities for future research. The aim of the study is to contribute to the identification of existing gaps in the understanding of the role of livestock production in urbanizing environments in relation to economic development and food security in developing countries (MacLachlan 2015; Frenkel and Orenstein 2012; Paniagua 2014). Specifically, we reviewed the literature to answer two key questions: (a) how does livestock production in developing countries relate to food security? and (b) how do urbanization and economic development influence this hypothesized relationship and impact food security outcomes? To address these questions and to identify the interlinkages between livestock production and food security in the context of developing countries, our study relied on the FAO’s definition of food insecurity, which states that it is ‘a situation that exists when people lack secure access to sufficient amounts of safe and nutritious food for normal growth and development and an active and healthy life’. Inherent to achieving food and nutrition security, according to the FAO’s definition, are four dimensions: availability, access (economic and physical), utilization and stability (FAO 2006). The literature review in this paper covers the interrelationships among these four dimensions of the concept of food security and livestock production in developing countries. The paper proceeds as follows. Section 2 describes the systematic review methodology and literature search processes. Section 3 discusses and synthesizes the results and Section 4 briefly summarizes the paper, provides policy implications and offers some thoughts for future research and extension. This study used a systematic literature review (SLR) approach, which involved identifying, critically reviewing, and integrating the available research findings of sufficient quality, based on clearly formulated criteria concerning a specific research question or subject, to the ultimate end of bringing about new synthetic insights (Lesnikowski et al. 2011; Higgins and Green 2011). Commonly used in medical and health sciences, the SLR approach has been applied in recent years to urbanization and environmental change studies to assess current knowledge about the impact of urbanization, and adaptation measures (e.g. Trindade et al. 2017; Warren et al. 2015). In our study, we build on these applications to analyze peer-reviewed articles on urbanization in relation to livestock production, economic development and food security in developing countries. To be distinguishable from a “traditional” literature review, Briner and Denyer (2012) point out that an SLR must place a special emphasis on meeting four main features: (a) having comprehensive coverage of the literature; (b) carefully considering the quality of the included evidence; (c) following a clear and pre-identified systematic approach to synthesize the compiled information; and (d) ensuring transparent and rigorous processes. Following Mallett et al. (2012), the SLR in this study had the following key steps. First, relevant search terms were identified in accordance with the objective of the review. Second, a protocol describing definitions of search strings, search strategy, and inclusion and exclusion criteria were developed, peer-reviewed and piloted. Third, a systematic search of the literature was conducted. Fourth, the results of the search were screened by multiple members of the research team, as a quality control exercise, to ensure consistency and cross-check the results. Fifth, a strategy for extracting data from each eligible study and qualitatively synthesizing results across studies was developed and implemented. Each of these steps was peer-reviewed and piloted by different members of the research team. The following sub-sections provide a detailed description of the SLR process. As suggested by vom Brocke et al. (2009) a (systematic) literature review should begin with a broad conception of what is known about the topic and potential areas where knowledge may be needed. To this end, we began with a random Google search to identify relevant search terms (keywords) and the results of this search were then used to develop a matrix of search terms, which were discussed, refined and validated during a workshop that was organized in October 2017 in Uppsala (Sweden). The workshop brought together a selected group of researchers and experts from agricultural, rural development, animal, veterinarian and urban planning research institutes in developing countries. Based on the workshop discussions, the 161 search terms listed in Table 1 were identified as the most relevant search terms for the purpose of this SLR. A systematic search was run on the entire content of the PubMed, Scopus and Web of Science (WoS) bibliographic databases. These databases were particularly relevant to the scope of this SLR due to their broad coverage and quality of content (e.g., Clark et al. 2017; Frewer et al. 2013; Siva et al. 2016). PubMed covers over 23 million citations through a content of around 6000 journals and it focuses mainly on medical, veterinarian and life science fields (NLM 2014; Wang et al. 2017). WoS has a multidisciplinary content of high-level academic and scientific publications, containing databases of bibliographical resources that allow users to access one or more databases simultaneously (Mongeon and Paul-Hus 2016). Scopus provides access to more than 5000 international publishing houses on subjects including physical sciences, engineering and environmental sciences, and the social sciences and humanities collections (Elsevier 2014). A Boolean search approach was adopted to search the bibliographic databases, allowing for (a) combining all search terms under each of the main categories (that is, Livestock, Food Security, Economic Development and Urbanization) listed in Table 1 with an ‘OR’ operator, and (b) combining each group’s search terms with those of other groups using an ‘AND’ operator. 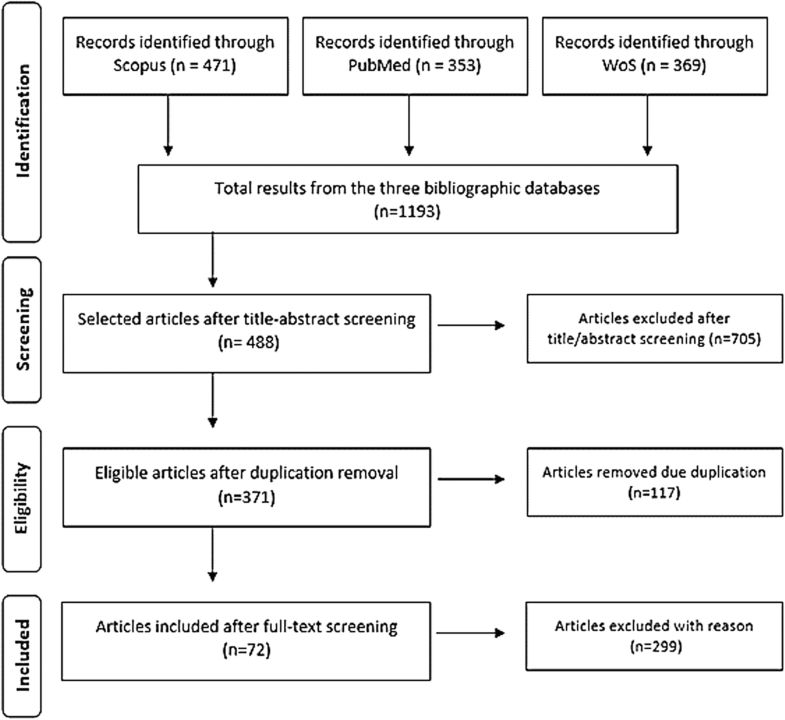 Overall, the literature search of the three bibliographic databases generated 1193 candidate articles consisting of 353 articles from PubMed, 471 articles from Scopus and 369 articles from WoS. The initial 1193 candidate articles were subjected to title and abstract screening to determine whether they met predefined inclusion criteria. An article would be considered for this review if (a) it addressed the components of the conceptual model and examined the relationship between livestock and food security, and (b) the article must have been conducted or focused on any of the developing countries/regions1 listed in category 4.b (countries) in Table 1. A selected sample of 30 articles from each of the databases (n = 90) was randomly selected and two members of the study team separately screened them by title and abstract to ensure a common understanding and agreement within the study team about the inclusion criteria. Following this crosscheck exercise, all the candidate articles were screened by title and abstract, excluding an additional 705 articles as irrelevant. Next, after title and abstract screening, the remaining articles (448 articles) from the three databases were pooled together and filtered for duplicate removal. After this step, 371 peer-reviewed articles remained. Figure 1 provides a disposition of studies identified and included in this review. Based on authors’ previous experience in SLRs, title and abstract screening was deemed insufficient to reflect the content of the articles and could result in many articles irrelevant to the objective of the systematic review. Also, since the candidate articles were extracted from the bibliographic databases by two different members of the research team, a second pre-full-text screening was implemented. Specifically, members of the research team were asked to re-screen the results that had been extracted by other peers in the team. This exercise ensured that every result in our pool of articles had been examined by at least two different members of the research team. This procedure excluded an additional 229 articles. The major reasons for the exclusion of articles at this stage were: (a) the article focused mainly on the food value chain and not on the livestock production itself, (b) the full text of the article was unavailable in English, (c) the article didn’t address any aspects of urbanization, or (d) the article was an erroneously included duplicate or other version of another article in the dataset. Ultimately, 72 articles, representing approximately 6% of the total initially-identified articles met our criteria for inclusion and were advanced to full-text screening, data extraction and qualitative synthesis. A list of these 72 articles is provided in Table 2. A list of the identified articles was sent to the expert group members (who participated in our workshop and contributed to the identification of search terms) to review and give feedback on the extent to which they would accept these articles as a good representation of this literature as they knew it. Figure 1 provides an overview of the whole literature search process, including the number of articles excluded at each stage. A shift from crop-mixed traditional dairying to market-oriented organised dairy farming- Plausible factors responsible for structural transformation in Indian dairy sector. Shah, J. & Dave, D.
Tibbo, M. & van de Steeg, J. Identification and quantification of subsidies relevant to the production of local and imported pig breeds in Vietnam. Khan, A.A. & Bidabadi, F.S. Managing to harvest? Perspectives on the potential of aquaculture. Patterns of change in beef production and consumption in Africa. Tambi, N.E., & Maina, O.W. Assessment of food safety risks associated with pre-slaughter activities duringthe traditional slaughter of goats in Gauteng, South Africa. Qekwana, N.D. & Oguttu, J.W. Thornton, P.K. & Herrero, M.
Drivers of household food availability in sub-Saharan Africa based on big datafrom small farms. Kawarazuka, N. & Béné, C.
Sabiiti, E.N. & Katongole, C.B. Smart investments in sustainable food production: revisiting mixed crop-livestocksystems. Household dietary diversity and animal source food consumption in Ethiopia: evidence from the 2011 Welfare Monitoring Survey. Hauck, S. & Rubenstein, D.I. Powell, J. M., et al. Liang, J.B. & Devendra, C.
Hishamunda, N. & Ridler, N.B. Mottet, A. & Tempio, G.
Higher fish but lower micronutrient intakes: Temporal changes in fish consumption from capture fisheries and aquaculture in Bangladesh. Invited review: Role of livestock in human nutrition and health for poverty reduction in developing countries. Toufique, K.A. & Belton, B.
Pica-Ciamarra, U. & Otte, J.
Jordaan, J.W. & Alderson, M.
A detailed coding form was designed to extract information from and critically evaluate the selected articles in relation to the objectives of this SLR. In this coding form, each article was given a unique ID and the following information was extracted: title; first author’s surname; discipline and institutional affiliation of the first author; year of publication; journal name; journal area; number of citations on Scopus and WoS; and research question and main findings. Moreover, according to the content and narrative of each article, the coding form classified the articles based on the following aspects: livestock production (animal type, production system, scale of production, and livestock for livelihood); livestock diseases; stressors to livestock production; impacts on food security; the food value chain; urbanization as stressor; governance and policies; the studied area; the research type (review, qualitative, quantitative, mixed); research method (survey, interviews, questionnaire, secondary data, modeling, case study, etc. ); research design (cross-sectional study, longitudinal study, etc. ); sampling techniques (simple random, stratified, cluster sampling, systematic sampling, multistage sampling, etc. ); and the sample size. Next, we undertook a content-based coding of the sample articles to further investigate the research on livestock production and food security in urbanizing environments in developing countries based on two criteria: (a) the research problem – that is, the main issue addressed in the article; and (b) the research results – that is, the key research findings and implications or conclusions. Based on the results, the surveyed articles were categorized and analyzed in the following topical groups: context (urbanization), livestock production, spatial dimensions, and food security. Of the 72 reviewed articles, 25 studies reported findings from Africa, 20 from Asia, and six articles focused on other developing regions in Latin America (n = 3), the Middle East (n = 1) and the Pacific Islands (n = 2). In addition, 21 studies reported findings across developing regions of the world. The dominance of studies focusing on Asia and Africa was not surprising given the significant role that livestock plays in food security in these regions and also given that urbanization is occurring most rapidly in countries and cities of those two regions (Seto et al. 2012). It was generally observed that the reviewed literature was regionally and continently focused and less connected with relevant specific countries within these regions; 34 (47%) studies addressed livestock production in multiple regions of the world (Table 3). India, Bangladesh and Kenya were the most studied countries in the literature, with each of them being the case study in four reviewed articles, followed by Ethiopia, Mexico and South Africa (two studies each). As shown in Table 3, fewer studies (16) reported findings for specific cities or lower level zones within the investigated countries. In relation to the spatial scope of the reviewed articles, Fig. 2 shows that the literature covered a large spatial extent. Fewer than 30% (n = 21) of the reviewed literature addressed livestock production in developing countries from either urban and/or peri-urban perspectives. These findings concur with the findings of previous studies highlighting the sparse attention given by researchers and policy makers to the study of livestock production in relation to urbanization in developing countries and the implication of this relationship on food security (e.g. Frenkel and Orenstein 2012; Fuller 2003). While our SLR covered the entire content of the three bibliographic databases, Fig. 3 shows that research into livestock, urbanization and food security has emerged during the past two decades and has attracted a groundswell of attention in recent years from across a wide array of disciplines. This trend in the literature corresponds to the increasing recognition, at national and international levels, of the burgeoning challenges that increased urbanization poses to livestock sectors and its impact on food security in developing countries (Thornton 2010). The research team also examined the research design and methodologies of the reviewed articles. Qualitative methods were the most commonly used methodologies (47%), compared to 17% for quantitative methods. Moreover, around 19% of the reviewed articles relied solely on literature, and 17% of the articles used mixed methods including both quantitative and qualitative methods. The major data collection tools included secondary data (n = 28), while other techniques such as survey, case study, interviews, and others were less common. Surprisingly, none of the reviewed articles utilized remote sensing or GIS techniques, which are becoming increasingly common data collection techniques in research related to urban planning, in relation to land-use and land-cover changes and agricultural production systems. In terms of research designs, the results show that exploratory prospective designs dominated the reviewed literature (n = 56), followed by cross-sectional designs (n = 13). Longitudinal designs (n = 3) and other designs were rarely used. In terms of the studied livestock production systems, Fig. 4 shows that 34 of the reviewed articles focused on specific livestock systems while the remaining studied multiple (n = 38) and or unspecified livestock systems. Around 80% of the reviewed literature focused on smallholder farmers and small-scale production systems (n = 58), while other studies focused on larger scales of production or did not specify a production scale. Overall, the reviewed literature is widely influenced by the model of small-scale subsistence livestock, which has been promoted by international development agencies as a direct entry point for poverty alleviation in developing countries. Aquaculture systems overshadowed the literature with 15 articles mainly investigating fish production in urbanizing environments in developing countries. Of these 15 articles, 12 articles addressed small-scale fish production, seven articles investigated medium and large-scale production and three articles did not specify the scale of fish production. Cattle production was discussed in seven of the reviewed articles, which consisted of three studies looking at small-scale production and one study on large-scale production. Furthermore, seven other articles focused on poultry production, three on pig production and two on goat production systems with small-scale production being the most dominant in these articles. In this respect, Belton and Bush (2014) indicated that aquaculture has become both an outcome and a harbinger of urban development and a ubiquitous feature of the peri-urban fringe. This can particularly be observed throughout peri-urban Asia, where aquaculture represents a link between rural and urban livelihoods; competing for land and labor with often more lucrative or stable urban livelihood opportunities and land uses, and with other often less specialized, less profitable or more labor-intensive agricultural practices (Belton et al. 2009). Furthermore, Arthur et al. (2013) point out that peri-urban fish-farmers are more likely to generate higher incomes, net returns and longer-term financial viability, than similar producers in more remote rural areas due to access to both inputs and higher value markets. Mapping the methodological approaches and the analyzed livestock systems in the reviewed articles together with the distribution of the literature across developing countries shown in Table 3 and the authorship of the 72 articles indicated a clear symptom of fragmentation in the reviewed literature. Specifically, existing studies seldom build on each other or establish a series of articles by the same or related authors and research teams. Moreover, the study of livestock and food security in the surveyed literature varies across settings, i.e. varied livestock production systems and consumption patterns. With such heterogeneity, broad generalizations regarding the inter-linkages of livestock production with food security may be unreachable, and policies that do not consider the local environmental and economic landscapes are unlikely to be effective. According to Dorward et al. (2005), livestock production may make a variety of contributions to the economic development of keepers, including, as portrayed in Fig. 5: improving farmers’ income (64 articles), by providing regular cash income from sales of products (e.g. milk, eggs, meat, hide and horn, wool and manure), services (e.g. work, transport, breeding sires, and ceremonial purposes), or live animals which can be used by farmers to spend on other household items; consumption, by providing a source of LSF for the household; insurance and buffering (20 articles), to cover unexpected costs and absorb the shock of an unexpected event; social, by giving the keepers a higher social status and a respect of the community; saving, by serving as a financial source that can be drawn upon later in the season when lower production and income are not sufficient to support consumption needs; and accumulation, by increasing famer’s overall income and production. Figure 6 shows that the reviewed literature focused particularly on the availability aspects of food security, addressing issues such as the impacts of urban agriculture’s promotion on food production and the implications on hunger and poverty alleviation, and the role of livestock production systems in increasing food supply and ensuring adequate and nutritious food for populations (Lee-Smith 2010; Beveridge et al. 2013; Herrero et al. 2010). 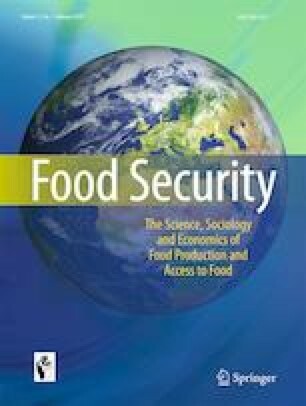 Stability in food supply came next in terms of the addressed dimensions of food security where notable research has examined factors that influence livestock supply over time (Heath 2006; Frelat et al. 2016; Drucker 2006; Belton et al. 2012; Das et al. 2008). In regard to the “utilization” dimension, the reviewed literature has addressed issues related to livestock source, food safety and quality aspects in relation to urbanization (Madaleno 2000; Kawarazuka and Béné 2010; Penrith et al. 2013). Lastly, articles discussing “accessibility” to livestock products and LSF focused primarily on livestock price volatility and its impacts on consumption patterns and the food security of the poor. Furthermore, this segment of the reviewed literature addressed the adaptation processes that livestock producers undergo to adjust to different situations or conditions (e.g. new urban markets, economic fluctuations, technologies and livestock production methods) and their impacts on households’ accessibility to livestock products (Toufique and Belton 2014; Losada et al. 2000; Cleasby et al. 2014; Bell et al. 2015). The relationship between livestock production and food security goes two ways. Livestock production improves farmers’ incomes, especially in less endowed regions, contributing to their economic development and enabling them to access food, and therefore enhances their food security (Saxena et al. 2017). Activities aimed at achieving food security along the food chain (from production to consumption) have in many cases significant positives (e.g. increased livestock supply) and negatives (e.g. degradation of natural resources, local and regional pollution (Westhoek et al. 2016). As given in Fig. 7, the surveyed literature shows that the relationship between livestock production and food security is affected mainly by the following five groups of stressors and influencers: socio-economic stressors, with articles discussing aspects such as income growth, globalization and market developments, and institutional and physical infrastructures (e.g. Shah and Dave 2010); natural resources, discussing issues such as land and water resource management and growing demands for energy and natural resources (e.g. Rossignoli et al. 2015); environmental, most often concerned with droughts, pollution, land use and land cover changes due to or exacerbated by climate change (e.g. Thornton and Herrero 2014); demographic, with articles discussing migration movements, population growth, and dietary and consumption pattern changes (Khan and Bidabadi 2004); and urbanization. Realizing these multiple stresses on livestock systems, satisfying sustainably current and future food demands and meeting food security goals in developing countries becomes a complex challenge. Particularly, there is a need to balance providing adequate diet equitably and ensuring the sustainability of livestock systems while minimizing environmental degradation and without undermining the economies supporting the livelihoods of actors on the livestock value chain. Based on a slightly modified version of the FAO sustainable food value chain framework, Fig. 8 summarizes the reviewed articles according to their discussion of different elements of the livestock value chain (FAO 2014). Notably, the literature is mainly concerned with the two ends of the livestock value chain, while the vast majority of the reviewed articles either focused on “production” or “consumption”. However, other intermediate elements of the value chain, such as aggregation and processing activities, received less attention in the literature. For instance, only 10 articles discussed “aggregation” which is an especially relevant element in food value chains in developing countries since efficient aggregation and other primary post-production activities on the small volumes of production from widely dispersed smallholder producers is often a major challenge in these countries. In most of the reviewed articles, the discussion of livestock value chains often terminates at “consumption” while only a few studies went on to discuss resource recovery and waste recycling. The less attention paid to livestock waste management in the reviewed literature is a major shortcoming that may have significant implications on achieving sustainable livestock value chains in developing countries. As noted by Mathias (2014), livestock production has great potential for environmental degradation as the sector produces a large volume of gases, organic material, bacteria, and other substances, posing significant risks for air, soil, and water contamination. When untreated or poorly managed, livestock waste can have severe consequences for the environment such as odor problems, attraction of rodents, insects and other pests, release of animal pathogens, groundwater contamination, surface water runoff, deterioration of the biological structure of the earth and catastrophic spills (Sakar et al. 2009). Table 4 shows that the surveyed literature focused on research problems and questions mainly addressing “urbanization” and other “socioeconomic stressors” in relation to livestock production in developing countries. Such a particular focus on urbanization in the literature is expected given the purpose and design of our systematic review. Principally, discussions of urbanization and socioeconomic stressors (particularly population growth, rising incomes and dietary shifts) were primarily concerned with causes and patterns of change and adjustments in livestock production and consumption as a result of increased urbanization and socioeconomic pressures. Growing income in particular is discussed as changing market structures both among producers, due to opportunity costs and production requirements, and consumers and their expenditures on LSF (e.g. Steinfeld 2003; Powell et al. 2004). The surveyed literature focused particularly on potential future scenarios and outlooks for livestock production under the dynamics of urbanization and it often viewed urbanization in this context as presenting both challenges and opportunities for livestock production in developing countries (e.g. Rufino et al. 2013; Delgado et al. 2001). Specifically, on the one hand, urbanization may stimulate demand and thus cause a fierce competition for land and water resources in developing countries, which could be a barrier to livestock production. On the other hand, urbanization offers employment and market opportunities to smallholders and livestock keepers in developing countries who can benefit from increased demand for LSF, improved infrastructures and new technologies. • Urbanization has a considerable impact on food consumption patterns. • Urbanization impacts traditional animal agriculture. • Urbanization influences animal genetic resources and improves the development of new technology. • The literature often focuses on the changes occurred in the production and consumption patterns of animal products due to urbanization and socioeconomic stressors. • Urbanization is discussed as a primary cause for an increasing demand for animal source food. • Together with Urbanization, income and population growth and socioeconomic challenges are primary facilitators of growing demand for animal source food and consumption dynamics. • Urban income growth creates opportunity costs pressuring farmers to increase efficiency and productivity. • Income growth has a direct impact on dietary changes. • Growing demand for animal source products has significant implications for food safety and quality standards. • The literature often assesses the prospective future of changes in demand for animal source food. • Growing demand for animal source food is discussed as both a challenge and an opportunity. • The increase in demand for animal source food presents a major concern for developing countries due to over-exploitation of natural resources and the significant stresses on livestock production systems. Table 5 highlights the key production related aspects of livestock systems in the surveyed literature. Notably, aquaculture systems constituted a large part of the discussions in the literature which were argued to have a significant role in improving the supply of dietary protein, and increasing household incomes and the food security of the poor, in particular (e.g. Muir 2005; Chiu et al. 2013; Naylor 2016). Other livestock systems (denoted livestock in Table 5) are primarily discussed in their contextual relations with socioeconomic and environmental systems. Frequently assessed as mixed crop-livestock systems, livestock production systems are heavily influenced by, and themselves influence, land use changes, water availability, sanitary practices and environmental conditions (e.g. Herrero et al. 2013; Thornton 2010; Herrero et al. 2010). At the same time, environmental issues, such as climate change and animal disease, affect the livestock sector and its production systems. Livestock value chains are another important component of this aspect of the surveyed literature while it discusses a range of issues related to the value chain. Particularly, the literature focused principally on subsistence and semi-subsistence small livestock production systems, establishing that small-scale livestock production is essential for food security provision, and that it can be negatively impacted by poor policy implementation and increases in intensive large-scale livestock production. The actors involved in livestock production are frequently placed in rural spaces, while the consumption is predominantly discussed in urban contexts (e.g. Devendra 2007; Krause et al. 2015). The expansion of production systems requires market access, which due to a lack of infrastructure or policy is often limited. It was further found that the interconnection of livestock and crop production can create dependencies that threaten the availability of animal feed. While several articles problematized the value chain length as in need for extension, the literature at large shows that lengthening the value chain both solves and creates issues, particularly problems with resources and environment (e.g. Frelat et al. 2016; Sumberg et al. 2017; Tibbo and van de Steeg 2013). • Aquaculture is of central importance for supplying animal source protein in developing countries. • Due to its accessibility and low prices, fish is a common food for the poor in rural areas in developing countries. • Aquaculture can improve overall livelihoods and food security, but it requires investments in infrastructure and the institutional environment, and regulatory policies. • A large proportion of the literature discusses diet changes and the channels through which aquaculture can promote food and nutritional security in developing countries. • Constrains to aquaculture are normally discussed in relation to feed prices, water quality, land-use and the natural environment. • Livestock production embedded in complex systems of cultural, social and economic aspects. • Livestock keeping has different roles in developing countries. It contributes to food security, economic growth, human well-being and cultural values. • Livestock production needs to adapt to new consumption patterns and the market transformations occurring especially in urban areas. • Much of the literature is concerned with the role and importance of a specific form of livestock production in a particular context. • Livestock contributes significantly to food security and poverty reduction. • Livestock production can be criticized for its environmental consequences, as affecting land use, accelerating climate change and affecting water availability. • Livestock and crop systems are usually discussed as interlinked. • Small farm systems are essential for providing food security and alleviating poverty in the rural poor population. • Subsistence and semi-subsistence farming represent major systems of livestock production in developing countries. • Large-scale and intensive production of livestock can negatively impact small-scale producers and thus exacerbate food insecurity and poverty. • The literature concentrates extensively on livestock production and consumption, whereas less attention is paid to other elements and actors along the value chain. • Livestock consumption is frequently discussed in urban areas whilst production is discussed in rural spaces. • The literature often focuses on the role and impact of livestock production on the food security of poor households and small scale producers. While the reviewed literature covered the whole spatial spectrum as shown in Fig. 2, Table 6 illustrates that the discussion of the urban spatial dimension most frequently focused on dairy or poultry production. This is in part due to the severe resource constraints of urban agriculture, which make other forms of production less feasible, such as insufficiency of land. Viewed as having a significant role in the nutritional intake and socio-economic safety of poor urban households, the literature calls for the need to regulate urban agriculture as a strategy to help reduce the socio-economic problems experienced by the poor. In light of resource use constraints in developing countries, this aspect more frequently included discussions of resource re-use and recovery than the other aspects (e.g. Madaleno 2000; Mkwambisi et al. 2011; Ayenew et al. 2011). While the urban dimension is rarely clearly distinguished from the peri-urban dimension, the literature explicitly dealing with peri-urban agriculture often points to an additional form of resource constraint: a lack of self-sufficiency and sustainability due to a strong dependence on external resources (e.g. Cleasby et al. 2014; Graefe et al. 2008; Vagneron 2007). The rural dimension is commonly discussed as being impacted by urban and peri-urban development, rather than the other way around. These include more spatial developments such as urban sprawl as well as economic and market changes, such as large-scale producers reducing market prices (e.g. Besbes et al. 2012; Toufique and Belton 2014). • Urban agriculture, including livestock activities, has expanded rapidly over the past two years. • This has been associated with the worsening economic situation of the urban population, exacerbated by migration from rural to urban areas. • Urban agriculture, particularly dairy and poultry production, can contribute significantly to household incomes and food security. The literature addresses the causal relationship between socioeconomic and environmental changes and the livestock activities within, or in the proximity of, urban and peri-urban areas. • The literature shows increasing focus on resource re-use and recovery than the literature on other spatial dimensions. • Urban agriculture needs to be regulated as a strategy to help reducing socio economic problems experienced by the poor. • Peri-urban agriculture has emerged as the most robust agricultural activity because it requires small patches of land close to urban areas. • Peri-urban livestock production needs to be adequately integrated into the planning and management of urban systems. • There is a growing competition for land in peri-urban areas between agricultural activities and urban development. • Policies for peri-urban agriculture need to be adjusted to the size, distribution, and dynamics of agricultural land in the peri-urban region. • The literature rarely draws clear distinctions between peri-urban and urban agriculture and livestock activities. • Production of food in peri-urban areas is often dependent of urban markets. • There is increasing attention on the considerable issue of resource and environmental sustainability in relation to peri-urban agriculture. • Rural producers have to compete for market space with the large-scale producers that normally dominate urban spaces. • Rural areas are often characterized by poor households and traditional production systems. • Rural spaces are usually discussed as being influenced by non-rural developments, rather than impacting non-rural spaces themselves. • Rural depopulation is often discussed as part of individual strategies for income diversification. The fourth aspect of our content-based assessment of the reviewed literature was concerned with food security (Table 7), which is largely seen as interrelated with other dimensions, in particular as a consequence of increases in livestock production. According to reviewed literature, factors such as disease management, reproductive performance, land-use issues, improvement in trade and marketing systems (especially for rural and poor producers), policies and regulatory compliance should be taken into consideration in order to improve livestock production. Food security is also discussed as often relying on the knowledge of farmers and their education, which are frequently researched as the causes of, and the potential solutions to problems related to the production system and animal disease. Also, the literature indicates that food availability needs to be accompanied by food access in order to strengthen food security in developing countries, especially of the poor (e.g. Bell et al. 2015; Belton et al. 2012; Beveridge et al. 2013). Animal diseases are found to be a complex challenge, particularly in traditional livestock production systems. Epizootic outbreaks can have devastating impact on food production and prices, especially impacting poor farmers. A lack of education about sanitation and knowledge regarding health issues are frequently discussed as a cause for animal disease related issues, presenting a potential leverage point to ameliorate them (e.g. Penrith et al. 2013; Heath 2006; Randolph et al. 2007). Further, the literature frequently researched strategies to eradicate diseases in livestock production and its impacts on the value chain. The expansion of value chain length is, for instance, discussed as ambivalent, solving some issues, such as resource access, but exacerbating others, such as food safety. - Increased food availability needs to go hand in hand with increased food access. - In order to improve the production of animal source food factors such as: disease management, reproductive performance, land-use issues, improvement in trade and marketing systems especially for rural and poor producers, policies and regulatory compliance should be taken into consideration. - Epizootics have direct impacts on the global economy, affecting the prices of animal products as well as feed grains. - The increase in large-scale commercial farming in conflict with small-scale producers. - Livestock production can be dependent on crop production surplus. -Food security is discussed as one among several concerns, especially the environmental challenges. -Food security is discussed as a positive consequence from livestock and aquaculture production in developing countries. -The literature often researches strategies to eradicate diseases on livestock production and the disease impacts on the value chain. -The knowledge of farmers and their education are frequently discussed as causes of, and potential solutions to, production systems and animal disease related problems. -Environmental Issues, such as climate change and animal diseases, affects the livestock sector and its production system. -Expansion of value chain length discussed as ambivalent, solving some issues such as resource access but exacerbating others such as food safety. - Livestock keeping enhances both economic and physical access of households to food in general and animal-source food in particular. - Livestock keeping enables direct access to animal-source foods, and cash income from sale of livestock and livestock products can be used to purchase food especially during times of food deficit. - Livestock contributes to increased food supply as a result of improved productivity from the use of manure and traction. - In some remote areas in developing countries, livestock improves physical accessibility to food by helping their keepers transport food commodities to markets and from markets to homesteads. - Access to animal source food can be improved by technology equipment, supported by social, political and economic capacity of the households. - Rapid expansion of commercial animal source food alters the prices affecting changes in consumption behavior. Bogard et al. (2017); Bell et al. (2015); Beveridge et al. (2013). - Livestock keeping contributes to food and nutritional security and the livelihoods of the rural and poor population.- Animal diseases are hard to control and eradicate, especially because of animal maintenance in traditional production systems. - Livestock is often utilized as part of traditional and cultural considerations, being considered as prestige and part of social and recreational values. - Globalized markets and production systems, especially in developing countries, impact economic strategies and market participation of pastoralists and consumers, increasing their risk of losing access to food. - Food Stability depends on participatory approaches, decision-making and policy creation to reduce food insecurity. - Food Stability requires technical, infrastructural and informational aspects in adapting to climate chance, economic crises, degradation of rangelands etc. This study examined research that addressed the interactions between livestock production and food security in urbanizing environments in developing countries. An explicit and rigorous literature search was undertaken using the entire archives of the PubMed, ISI Web of Science and Scopus databases resulting in 72 articles that were included in the final review. The results pointed towards a number of research gaps as well as important findings with policy implications, providing an opportunity to support additional research to improve the understanding of how livestock production systems in developing countries might evolve under urbanization dynamics to meet the increasing demand for LSF and food security objectives. The first clear gap in the literature is the lack of studies investigating the interrelationship between livestock production and food security under rapid urbanization in developing countries. While there is a rich and varied bibliography on each of these components (livestock production, food security and urbanization) taken alone, numbers diminish significantly when considering the relationship between two of them, and drop much more significantly when considering all of them together. Specifically, of the 371 articles from the primary screening process, only 72 articles, or approximately 6% of the total initially identified articles, were advanced and included in the final full-text screening and qualitative synthesis. Related to the lack of studies on this subject, there are clear symptoms of fragmentation in the literature. The existing knowledge about the interrelationship between livestock production and food security in urbanizing areas of developing countries therefore draws from a few primary research studies that vary in their methods and objectives. Thus, it is difficult to acquire a comprehensive and comparable review of factors that influence the roles and impacts of livestock production on food security. Another obvious feature of the fragmentation is that existing studies are positioned in different research areas, and varied production systems and consumption patterns. The reviewed articles therefore rarely build on each other to create cumulative and progressive research that bridges across developing countries to obtain a generalizable understanding of the research area. Drawing generalizations from the surveyed literature regarding the inter-linkages between livestock production and food security may, under such heterogeneity, be unreachable. While existing research suggests that livestock production represents a potential pathway out of poverty and food insecurity for many of the poor in developing countries (e.g. Herrero and Thornton 2013), such fragmentation in the literature reduces the potential contribution of livestock sectors to achieving these objectives. Therefore, a further focus through a holistic, and interdisciplinary, approach on the interrelationships between livestock production, food security and urbanization in developing countries is much recommended. Next, this review shows that the surveyed literature is “qualitative” in nature, which is something to be expected in an emerging research field. Another characteristic of this literature is that there are, so far, very few comprehensive models to serve as a basis for, and integration of, empirical evidence. Overall, the literature tends to define and describe a set of views and explore linkages related to livestock production and food security, rather than to measure their extent. Furthermore, the consistency of such evidence is unclear as it is mainly based on local examples, which does not allow for empirical generalizations, per se. As one of the main functions of qualitative research is to provide theoretical grounding and thematic creation for quantitative research, there is a need to strengthen the theoretical basis of research on livestock and food security to feed into and inform specific quantitative questions. An extant theme across the reviewed articles was the need to eliminate barriers and stressors to livestock production (e.g. environmental, demographic and socioeconomic constraints). Of particular relevance to the purpose of this review are the challenges posed by increasing urbanization to livestock production systems in developing countries. In this respect, the existing research has confirmed that the uncertainty induced by urbanization on livestock production in developing countries is complicated by the lack of reliable data, particularly on small-scale keepers. As a result, most of the attempts to estimate the effect of urbanization on livestock sectors and food security are still to be considered as highly hypothetical and lack consistency in assumptions and methods. Therefore, more tools and methods are urgently required to estimate the impacts of urbanization on livestock production and on food security at both local (city), and national levels. In this regard, as urbanization continues to accelerate, many cities across the globe are revising their regulatory frameworks and strategies to more clearly address agricultural and livestock activities and many cities have developed strategies for regulating the keeping of livestock (Blecha 2016). An important priority for future undertakings should focus on examining the outcomes of these policies. The next area requiring significant research is related to how food security and its various dimensions are addressed in the surveyed literature. The review highlighted that food security is often defined more narrowly with a primary focus on inter-linkages between livestock supply, particularly the “availability” of LSF, and food security. More specifically, the food security challenge is mainly seen as one of increasing livestock production to meet increasing and changing demand for LSF by growing populations. In contrast, relatively less attention is paid in the reviewed articles to other dimensions of food security (e.g. accessibility, utilization and stability), which are often considered somewhat separately within the literature. Likewise, less attention is paid to issues related to livestock supply chains and waste management issues which also might relate to food security. As food security is a multidimensional phenomenon, not just about supply, but including socio-economic issues of access, affordability, utilization and stability, it is of particular importance for research aiming to understand the livestock systems in the context of rapid urbanization to put more emphasis on addressing these dimensions that drive food security in developing countries and how they possibly interrelate. Another major finding refers to livestock value chains. Customarily, the literature has extensively concentrated on livestock production and consumption, and has widely ignored other elements and actors along the livestock value chain. However, as noted by Rich et al. (2011), the livestock value chain in developing countries is rather complex and characterized by long marketing chains featuring large distances, many levels of traders and transactions, multiple steps and stages of processing, and a variety of employment-creating services and inputs. Particularly due to urbanization processes, traditional livestock supply chains are lengthening and becoming more complex. This is because the increasing demand of urban consumers, coupled with land scarcity in peri-urban surroundings, increases the length of the livestock value chains within a country, but also within regions (FAO 2016). In this regard, Shields (2013) points out that lengthening livestock value chains present opportunities for chain actors; however it does not guarantee improved outcomes for all actors and stakeholders along the chain. The reason is to a great extent because the transition in the food system, due to urbanization, generates new challenges to farmers who face additional challenges with fulfilling new standards, to supply chain actors whose livelihoods may be threatened, and to consumers in the form of increasing food price and quality. Together these issues emphasize the need for research to address the “missing middle” in livestock value chains by considering the full continuum of the chain from production to consumption, including inter-linkages, distributional benefits, and institutional arrangements across different production and marketing channels. A better understanding of the connectivity of actors to one another outside the livestock value chains from a dynamic perspective is crucial for identifying strategies which could make significant and sustainable impacts on livestock production systems and food security in developing countries. While the original focus of value chain analysis is on improving market efficiency, future studies should also address issues such as risks of disease transmission in the production and market chain, practices of actors in the chain, regulation and control of the chains, and knowledge, technology and support service options for risk reduction. Addressing these food safety issues at all stages of the livestock value chain is fundamental as these issues are also likely to pose further constraints on small farmers’ participation and competitiveness within modern markets and value chains. Furthermore, future research should investigate power relations along the livestock value chain, particularly women’s participation in post-production stages. Enhancing gender equality in livestock value chains has proved to be a successful approach to improving the food security of households and increasing their dietary diversity and food adequacy (Njuki et al. 2013). Linked to the previous finding, the results of this review show that there is less recognition within livestock value chain analyses of the porous boundary between livestock waste and the threat to food security in developing countries. As noted by the FAO (2017), by reducing food loss and waste along the livestock value chain, pressures on fragile ecosystems and the food system to produce more are lessened, greenhouse gas emissions are reduced, livestock systems become more efficient, and food security and nutrition are enhanced. According to Sakar et al. (2009), improperly managed animal waste can have severe consequences on the environment, such as odor problems, attraction of rodents, insects and other pests, release of animal pathogens, groundwater contamination, surface water runoff, deterioration of the biological structure of the earth and catastrophic spills. Thus, further research on how to reduce waste and losses in livestock value chains will be helpful towards achieving more sustainable livestock production in developing countries. Finally, our inclusion criteria might have excluded some studies of potential relevance for this review, including research published in the grey literature, research not in English, and research indexed in bibliographic databases other than PubMed, Scopus and the Web of Science. Despite these noted limitations, the overall search process was comprehensive and the bibliographic databases’ search strategy was designed in a way that retrieved articles based on multiple keywords and their synonyms. Moreover, the inclusion criteria were rigorously defined and implemented, and data coding, extraction and synthesis processes were performed with proper validation and quality assurance. Furthermore, a major strength of this review is that it is one of the first attempts to assess relationships between livestock production and food security in urbanizing contexts in developing countries. The authors adopted the World Bank categorizations of world regions and countries, see reference World Bank (2018). This study was supported by a research grant from the Agriculture for Food Security Program (AgriFoSe2030) at the Swedish University of Agricultural Sciences in Uppsala, Sweden. The authors would like to thank August Lindemer for his contributions to the literature search processes and the earlier drafts of the paper. Elsevier, S. (2014). Scopus content coverage. https://www.elsevier.com/data/assets/pdf_file/0007/69451/0597-Scopus-Content-Coverage-Guide-US-LETTER-v4-HI-singles-no-ticks.pdf. Accessed 15 may, 2018. FAO (Food and Agriculture Organization of the United Nations). (2016). Urbanization and rural transformation implications for food security and nutrition. Background Paper to CFS 43 Forum Discussion. http://www.fao.org/fsnforum/sites/default/files/files/126_Urban_Rural_Transformation/UrbRurZeroDraft.pdf Accessed 16 April, 2018. FAO. (2006). Policy Brief: Food Security. Geneva. http://www.fao.org/forestry/13128-0e6f36f27e0091055bec28ebe830f46b3.pdf. Accessed 20 April, 2018. FAO. (2014). Developing sustainable food value chains – Guiding principles. Rome. http://www.fao.org/3/a-i3953e.pdf. Accessed 05 February, 2018. FAO. (2017). The State of Food Security and Nutrition in Europe and Central Asia 2017. http://www.fao.org/3/a-i8194e.pdf. Accessed 26 March 2018. Fuller, R. (2003). Livestock and the livelihoods of the urban poor: A background document. Livestock Development group, School of Agriculture, policy and Development. University of Reading, UK. 76pp. http://citeseerx.ist.psu.edu/viewdoc/download?doi=10.1.1.1002.2882&rep=rep1&type=pdf. Accessed on 17 February 2019. Happer, C., & Wellesley, L. (2019). Meat consumption, behaviour and the media environment: A focus group analysis across four countries. Food Security, 11(1). https://doi.org/10.1007/s12571-018-0877-1. NLM, National Library of Medicine. (2014). Fact Sheet MEDLINE, PubMed, and PMC (PubMed Central): How are they different? http://www.nlm.nih.gov/pubs/factsheets/dif_med_pub.html. Accessed 12 June 2018. Shields, L. (2013). Feeding Hanoi’s urbanization: What policies to guide the transformation of the urban food system?, working paper N°06/13, IDDRI, Paris, France. https://www.iddri.org/fr/publications-et-evenements/document-de-travail/feeding-hanois-urbanisation-what-policies-guide Accessed 13 December, 2017. World Bank. (2018). How does the World Bank classify countries? https://datahelpdesk.worldbank.org/knowledgebase/articles/378834-how-does-the-world-bank-classify-countries. Accessed 18 March 2018.